Screaming teenagers, "Martin-I-want-a-child-from-you-posters" and packed crowds of people – no other place in ski jumping World-Cup is visited superiorly than the weekend-party of Willingen. Since 1995, on every World-Cup-weekend, up to 100,000 spectators went to Mühlenkopfschanze, but in 2001, it was required to change something, because the hill-certificate of the “old wood tick” (Dieter Thoma) ran out and wasn’t extend. 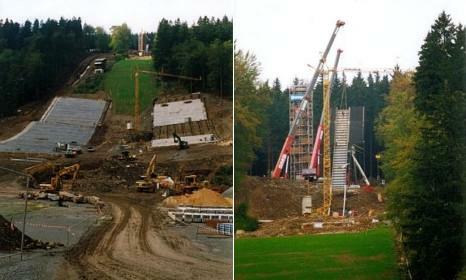 After Easter 2000, both rotten hills, at this time it existed a K89, too, were pulled down and for the price of – at this time – ten million German Mark and under time pressure the new building of the Mühlenkopfschanze and the extension of the ski stadium were forced, because in February 2001, the next World Cup in the Hochsauerland was planed. 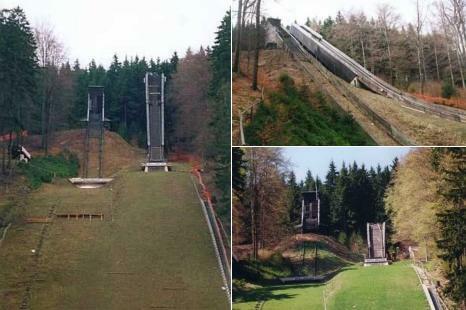 The new building, whereby with the Adlerhorst and the big balustrades everything was done for the jumpers and the spectators and which rise up to the biggest large hill of the world, was the important step for Willingen on the road to the German Ski jumping Mecca. About 50,000 cubic meters of soil, of that 15,000 cubic meters rocks were moved in Strycktal, to adapt the large hill to latest requirements of the FIS. Heavy excavators, caterpillars and trucks where at work to build the hill in time, also on Saturdays. Areas for spectators, in style of tribunes, raised the capacity of spectators of the that time most recent hill up to 38,000. About 3,300 meters of supply lines – for example for the production of artificial snow – had to be installed, a new functional house sprang up. Architect Prof. Burkhard Pahl from Darmstadt, who already designed the new central of the German Athletic Sports Association, wanted to build a hill with a modest steel construction, which could be reached by the jumpers with a cabin and an elevator. The sky dome of the hill should become landmark over Willingen. The construction was delivered at the end of August in small parts, which were already complete. It only had to be installed in Willingen. In November of 2000, the Adlerhorst, the “ufo” , which is the warm up room at the beginning of hill and the new infrastructure was finished, so that the first World-Cup at the new Mühlenkopfschanze at the 2nd of February could take place. The Finnish team won the team competition, Adam Malysz was the first hill record holder with 142 m.
Since that time, the ski jumping circus makes a pilgrimage more rather to Willingen, which is in 2005 for the ninth time venue of FIS-World-Cup-competitions. In those days, Willingen accomplished to enforce against the rivalry in the home country – Titisee-Neustadt and Oberhof forced on as venues, too – and for insisting with the new hill in Klingenthal, new floodlights were installed recently.